Nitrate levels are rising relatively rapidly due in the North Pacific Ocean due to human activity, according to new research from the University of Hawaii at Manoa. The rising levels are primarily due to industrial and agricultural processes and practices — this change is having a significant impact on the upper ocean nitrogen cycle in the region, according to the research. Based on the new research it appears that “rate of deposition of reactive nitrogen (nitrogen oxides from fossil fuel burning, and ammonia compounds from fertilizer use) from the atmosphere to the open ocean has more than doubled globally over the last 100 years”. At this current rate of anthropogenic deposition, the human-related effect is equal to roughly half of global ocean nitrogen fixation — which is the “natural process” by which atmospheric nitrogen gas is made available to organisms. The work — done in conjunction with researchers in Korea, Switzerland, and the US National Oceanic and Atmospheric Administration — was done as an attempt to assess changes in nitrate concentration between the 1960s and 2000s, across the whole of the North Pacific Ocean. This analysis has revealed that oceanic nitrate concentration has increased considerably over the last 30 or so years, across the open surface waters of the North Pacific — as a result of increased deposition of nitrogen from the atmosphere. 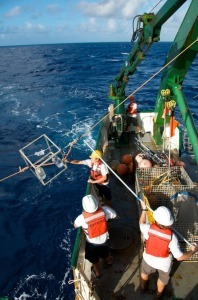 The researchers used ocean data in conjunction with the state-of-the-art Earth System Model to reconstruct the history of the oceanic nitrate concentration and make predictions about the future state of the North Pacific Ocean. Their assessment revealed a consistent picture of increasing nitrate concentrations, the magnitude and pattern of which can only be explained by the observed increase in atmospheric nitrogen deposition. “The burgeoning human population needs energy and food — unfortunately, nitrogen pollution is an unintended consequence and not even the open ocean is immune from our daily industrial activities,” stated Karl. As it is extremely likely that the magnitude of this effect will increase into the foreseeable future, it could need up, relatively soon, that the North Pacific Ocean possesses surplus nitrate — which will/would notably alter the food webs of the marine environment there. This would impacts fisheries amongst other things.